You don’t have to be “advanced” to take the Advanced Open Water Course. In fact it is designed specifically for the purpose of launching the advancement of your diving! So you can start anytime after earning your PADI Open Water Diver certification. The course helps build confidence and expand your scuba skills through different Adventure Dives. You’ll plan your individualized learning path with your instructor by choosing from a list of Adventure Dives offered at Go West Diving. The core curriculum of this course is a Deep Dive and a Navigation Dive. From there, divers will be able to choose three elective dives in order to complete the five dives required for this certification. PADI Open Water Divers or (Junior) Open Water Divers who are at least 12 years old are ready to step up and enroll in an Advanced Open Water Diver course. Young divers may only participate in certain Adventures Dives – check with your PADI Instructor. All students must complete a PADI Medical Statement prior to participating in any course. Should any of the medical history items noted on the Statement apply to you, you will need to consult with a physician prior to participating in scuba diving. So please be sure to download and review this statement in advance. Day One: You will meet with your instructor to complete your paperwork, and plan your course itinerary by choosing from a list of Adventure Dive options. There are two required dives – Deep and Underwater Navigation – and you choose the other three, for a total of five dives. The itinerary will vary depending on the 3 elective adventure dives selected. 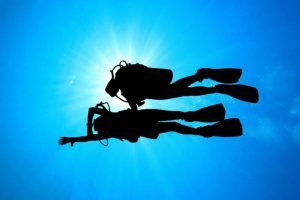 Select from: Boat dive, Drift dive, Multi level dive, Underwater Naturalist, Fish ID or Night dive.